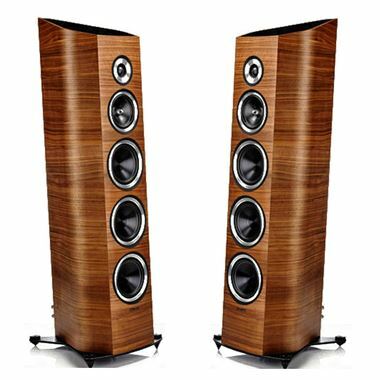 Ex Display Sonus Faber Venere S Signature Loudspeakers. Save £1000 and available with Online Finance and Free Delivery. With the introduction of the Venere S we have designed a speaker that goes beyond modernity, a stage but not an endpoint along our journey toward new and ambitious projects for the future. Completion and evolution of the collection, the "S" inherits Venere's design and has an electro-acoustic legacy strongly connected with the finest traditions of our brand. Venere S is made in Italy, at the Sonus faber headquarters in Arcugnano where it is assembled entirely by hand. Sonus faber starts over and evolves in order to offer hi-fi lovers a sound that reaches the heights of excellence, true to the legacy of the models that made this Italian brand famous around the world. This is the reason why of Venere Signature, the most powerful three-way speaker of the Venere line with three 180mm woofers for the best reproduction of lower frequencies and high-end standards. Venere S ideally bridges between the Venere and Olympica product families thanks to carefully thought out designs and precise solutions that create a surprising accurate and detailed sound stage. The design is faithful to that of the six current models of the Venere collection, thus ensuring seamless integration into multi-channel systems. The brushed aluminium around each driver gives a dash of character to the speaker’s front facade. The glass base found on the other Venere models is replaced by a brushed black aluminium plate with diamond edge to further energize the look of Venere S.
A new design for the reflex port fitted it in the lower part of the cabinet, directly facing the floor. This way the purity of the sound is not contaminated by the spurious vibrations generated by its powerful drivers. The three woofers cones of Venere S are made of aluminium, providing for maximum lightness and stiffness of the transducers to achieve a fast response to transients at low frequencies. 29mm high definition precoated fabric dome driver. DKM dome diaphragm visco-elastically decoupled from the baffle. Sonus faber design. 1x150mm cone driver. Ultra free compression basket. Thermo-mouldered polypropylene textile cone (Curv). Ultra dynamic performance and linearity. Special coaxial anti-compressor is used to remove resonances and distortions. Sonus faber design. 3x180mm cone driver. Free compression basket, Sonus faber design. Non-resonant “progressive-slope” design, optimazed phase response for optimal space/time performance, “paracorss topology” on every network. (Nano-technology deposition on the pcb rails). Cross-over point: 250Hz – 2500 Hz.